K ronomyth 25.2: WHERE THE BLUE MEETS THE GOLD. Universal’s double-disc Gold series is fast becoming the Gold standard for career compilations. The selections are presented in chronological order, wisely chosen, plentiful and well annotated. Well, maybe not so much on that last point; any mention of Patrick Moraz is stricken from the liner notes in keeping with the Moodies’ court contention that Moraz was never a member of the band and thus not owed royalties. (Apparently, he was just a keyboard player in a rock and roll band.) That unfortunate bit of business aside, Gold reflects what’s best about the Moodies. The first twenty minutes of music make a convincing case for the Moody Blues as the best of the post-Beatles pop bands. Some of Gold’s choices are questionable (“Lost in a Lost World,” “Forever Autumn”) and two of my personal favorites are missing (“For My Lady,” “Have You Heard”) as well as anything by Graeme Edge (“Ride My See-Saw” seems naked without “The Departure”), but the compliments far outweigh the complaints. Gold does seem overly weighted toward Justin Hayward’s songs; an obvious necessity, yes, but it sacrifices some of the band’s experimental and storytelling side that appeared in the collective effort of their albums. For longtime fans, there’s little on here that you don’t already own save perhaps a few “solo” selections. If you haven’t picked up a copy of Blue Jays yet, stop piddling around and buy it (and grab the expanded CD reissue, since the nonalbum “Blue Guitar” is a keeper). Lesser known (to American audiences anyway) is Justin Hayward’s contribution to Jeff Wayne’s The War of the Worlds, “Forever Autumn,” included here lest an extra John Lodge track accidentally be admitted into the fold and shift the balance of non-Hayward material to less than 90%. (In fact, Hayward is incorrectly credited as the author of the song, which was written by Wayne, Gary Osborne and Paul Vigrass). 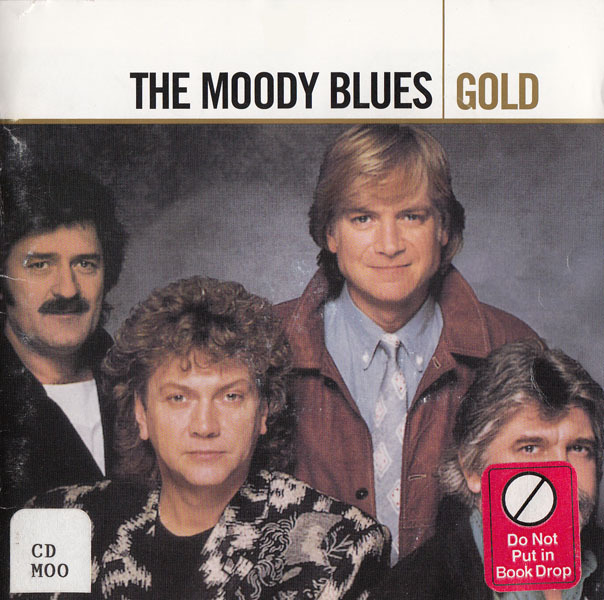 The second disc picks up the modern Moody Blues (plus the guy with the big hair they hired) at the halfway point, which places the emphasis on the classic material where it belongs. Token tracks from their last five studio albums bring listeners up to speed nicely without slowing down the disc’s momentum (“Your Wildest Dreams,” “I Know You’re Out There Somewhere” and “Strange Times” are the best bits from the lackluster later works). Universal has done it again with a double-disc compilation that’s worth its weight; too bad they didn’t make one of these for ELO.